A series of first-ever adventures featuring world-class athletes exploring socially and environmentally sensitive regions. These dramatic adventures will be captured on film for distribution on television, the internet, and our various media partners. Engage young people by inviting them to participate online through live websites. In the process, create a media presence that is inspiring, entertaining, and raises awareness of social environmental issues in the adventure region. These expeditions will also provide a fundraising platform for various i2P initiatives. Each adventure will serve as the model for socially responsible expeditions, inspiring the adventurer in all young people and teaching them to always challenge their perceived limitations. Starting February 1st 2017, Ray Zahab (CAN) and Stefano Gregoretti (ITA) embarked on an ambitious expedition to three separate regions of the Canadian North. The goal was to traverse each of these three diverse regions under human power, each requiring a different set of skills and training! The original route would take them close to 1,000km across the frozen north, where temps dropped below -60°C, and the risk of severe weather was always a hurdle. Expeditions are always unpredictable, this time even more so. After nearly being washed away in the icy waters of Labrador, the team would go on to successfully complete the second two stages. Endurance, logistics and unpredictable weather made this one of the most challenging expeditions either adventurer has attempted to date. 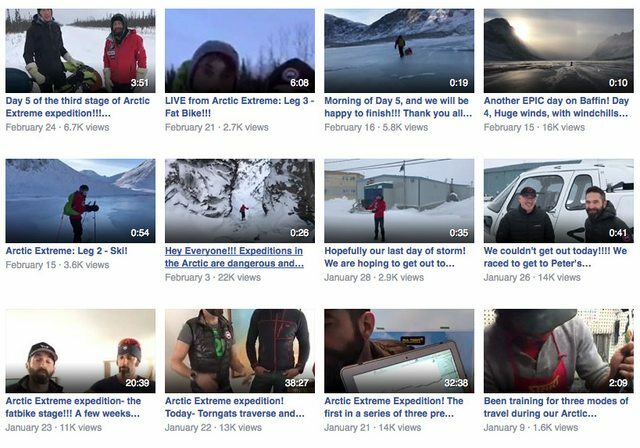 Check out the expedition videos on Ray Zahab’s Facebook page! In February 2016, adventurers Ray Zahab (CAN), Jen Segger (CAN) and Stefano Gregoretti (Italy) set out to a unique and challenging expedition that spanned 100 degrees celsius on the thermometer! Traditionally ultra runners, the team journeyed from -50°C (-58F) to +50°C (120F) over 1,500km, on mountain bikes and foot. In January 2015, Ray Zahab, Ryan Grant and Stefano Gregoretti ran over 1,200kms/800 miles across the Patagonian Desert- one of the most remote and extreme deserts on Earth. The Patagonian Desert is the largest of the 40° parallel and is a large cold winter desert, where the temperature rarely exceeds 12 °C and averages just 3 °C. The team traversed the desert in South American summer – with temperatures sometimes exceeding 40 °C. Ray Zahab and his friends Ferg Hawke, Stefano Gregoretti and Ryan Grant spent ten days in Canada’s Arctic on an unsupported crossing of the Akshayuk Pass (running for 48 hours, the other 8 days involved filming & learning in Arctic communities) and visited with old and new friends!The 2014 Baffin Expedition was part two in the To The Edge documentary series in which Ray and his film team share the extraordinary people and circumstances that are the real story of these running expeditions! This was be Ray’s 4th crossing of the Akshayuk Pass since 2007 and the team was excited to visit one of the most beautiful places on Earth. Ray Zahab and his ‘Running the Sahara’ teammate, Kevin Lin, attempted to run 2,300km across the Gobi Desert in approximately 35 days!Mongolia is the least densely populated country on earth, and is also the world’s second-largest landlocked country. The plan was to run 70-80 km a day across the Gobi Desert, to experience, share and learn about the culture of the nomadic people, the environment and all of the beauty and the challenges of the Gobi Desert. The expedition was shared live via website, live tracking and live videoconferencing. i2P Expreso de los Andes Expedition featured a 3-tier challenge with a purpose of educating, inspiring and empowering administrators, teachers and students to take on a Health & Physical Activity Challenge. Ray Zahab and Kevin Vallely attempted to run across the South American continent from Concon, Chile to Buenos Aires, Argentina. Joining them in the final non-stop stretch was a i2P Youth Ambassadors from a previous Youth Expedition! Simultaneously, school Principal George Singfield committed to and trained for upcoming challenges of his own – the Ottawa Half Marathon and a 50km trail running event in fall 2012! ‘Principal George’ has already enthused and inspired many teachers to follow in his footsteps and prepare for challenges of their own…will you? On February 12th 2011, i2P founder Ray Zahab completed the Atacama Extreme Expedition! The expedition began near the Peruvian border, north of Arica, and ended in the Province of Copiapo approximately 1,200km later. The expedition took a total of 20 days to complete and Ray ran an average of 60km per day while carrying camping supplies and relied on minimal daily water/food re-supplies. During the expedition, Ray communicated via videoconferencing to students everywhere! A self-supported, 1,100km speed trek from Hercules Inlet, Antarctica, to the Geographic South Pole in a record time of: 33 days, 23 hours and 55 minutes. Why? To inspire the adventurer in everyone by attempting the impossible-a self-supported speed trek in which three world-class adventurers pulled sleds weighing close to 200 pounds from Hercules Inlet to the Geographic South Pole, setting a speed record for this traditional expedition route. The trek covered 1,100km mostly uphill distance, taking the adventurers from sea level to approxiately 10,000 feet in temperatures of less than -40 degrees Celcius. The team achieved a new world record. Starting May 11th, 2008, Ray Zahab and a team of runners set off to run 80 kilometres a day for 13 days straight – through 13 provinces and territories – in an effort to inspire youth and raise awareness for the ONEXONE foundation!From participating with 10,000 students in Saskatoon to meeting with Assembly of First Nations Chief Phil Fontaine, the journey was both inspirational and effective in elevating awareness for ONEXONE.